2. Runners that really love to kick back after a long run, eat a ton of great food and drink tasty beer (those fellow runners over the age of 21 of course)! Now on the last thought I got to thinking of how refreshing an adult beverage is and how sharing a new set of brews with runners while sharing “battle stories” from the trail/race can be a very rewarding experience. 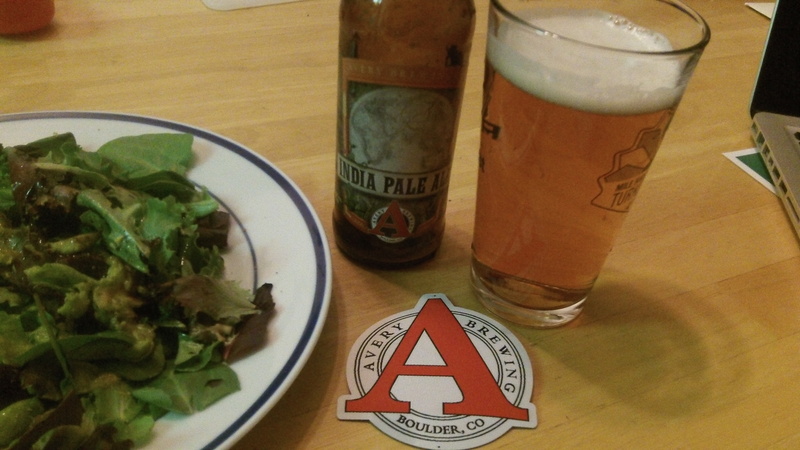 I’m not a total beer snob (I’m a “wannabe beer snob”), but I will say that IPAs have a special place in my heart and I genuinely enjoy the taste of a quality beer with my dinner after a challenging workout day . But I think a lot of us crazy ultra runners have a similar palate for these indulgences in life (and did you know having some beer helps with recovery and reduces inflammation due to polyphenols?!). …I think that that’s an awesome thing. So anyway, I’m very proud to announce that Avery Brewing Company (local to Boulder Colorado) is going to be sponsoring me! It’s always been my dream to help support and spread the word about local brands dear to my heart and Avery totally fits the bill. They make an amazing selection of craft beers that will whet the palate of beer snobs across the country. Whether you like IPAs, Porters, Stouts, Pilsners, Amber Ales, Brown Ales, Belgian Wheat, etc., Avery Brewing has a beer for you! I look forward to helping spread the word about such quality beers from a company that really cares about promoting events that get people together! Thanks for all the support and best of luck with your running (and beer tasting). Kicking back after a cold, snowy run. An Avery IPA really hits the spot! So what does this mean? Does it mean that you get free beer all year? Or does it mean free beer for you and all you trail running drinking buddies as well? it means i might be able to share some beer with several running buddies at events in the future…gotta get races and events interested in the brand first though! hey that great to hear! best of luck with your running and future races! Nicely done! It’s always been a dream of mine to have a beer sponsor. Yup, ultrarunning and beer go hand in hand! Sage, do you know about the circulation of Avery? We have lots of microbreweries in W. Wash. and I am not aware of your brand being available here. (tough competition). I’d like to try it with you one of these days!BTW, I heard the Hansons being plugged on one of the re-runs shown on cable TV of prior Boston ‘thons. I think it was in reference to Desiree Davila, could that be? Sage, great win last weekend. So, I have been checking out your site…great information and videos. Very inspiring! A question, since I did not stumble upon an answer to this question in my poking around: Unlike many long distance runners, you seem to have solid upper body muscle development. Do you incorporate strength and conditioning into your regime and, if so, what is your approach? Might be a great topic for an upcoming training vid. Thanks and cheers! hey thanks so much for the support! i used to lift a lot of upper body weights in college…mainly free weights and bench press. I also did a lot of pull-ups, push-ups and sit ups. I continue now with the core work but that’s it other than running a ton! I weigh about 5-10lbs less now as well. I think strength training has a place in helping prevent injury and in improving running form though! Sage, Have you ever heard/do you follow the rule that in order to receive a cardiovascular benefit from a workout, you must wait 2-3 hours after finishing before you drink? Hmmm. never heard of that one. I usually don’t drink within 2-3 hours after a run anyway…except in the summer…when I might walk straight in from a run and have a cold one while i stretch! I think I did try it. Did it have a bird on the logo? I liked all the NZ beer I tried except the “ginger beer” because it didn’t have any alcohol in it like i thought it would! Yep that’s the one! haha I know what you mean about the ginger beer…it’s like biting into a cookie that you think is chocolate chip, to find out it’s oat and raisin. They have released an actual alocoholic ginger beer recently though! Hey that’s a great cookie analogy! Congrats on signing up for Tarawera – I hope to make it back there next year too! Best of luck with your training.